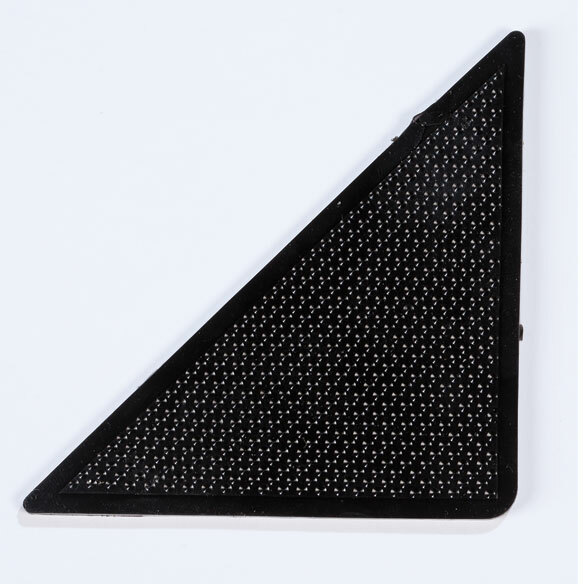 Corner rug grippers keep rugs in their place. Firmly attach rugs to carpeting and hard floors. Simply press polymer rug grips to underside to eliminate dangerous curling and bunching. Rinse to reuse. Will not damage floors. Set of 8; each 4 1/4" L x 3" W. Thermoplastic rubber/adhesive. Each year, thousands of unsuspecting Americans fall at home leaving many of them seriously injured and even disabled. In 2010, more than 12,800 people over age 65 died and 1.6 million were treated in emergency departments because of falls. Reduce your risk of trips and slips by keeping your feet firmly in touch with the ground. Use products that hold rugs in place and add traction to slippery surfaces. Never walk around the house barefoot or in socks/slippers with smooth bottoms. Ensure uniform lighting in rooms by adding lights to dark areas. Use motion-sensing lights so you can see where you're walking. Place lighting close to the bed, where it’s easy to reach. Preventative measures, such as handles and mats, lessen the chance of being caught off guard. Keep items used frequently on lower shelves (about shoulder level). Use a stool with a bar attached for additional stability when reaching items on high shelves. Place non-slip mats or strips on the floor of the tub or shower. Add bars inside and outside your bathing area and next to the toilet. Exercise regularly. Focus on increasing leg strength and improving balance. Identify your medications that may cause side effects such as dizziness or drowsiness. Keep an eye on your vision health and visit an eye doctor at least once a year. In addition to fall prevention at home, being aware of weather and terrain conditions when you venture outdoors is also important. Easy Comforts offers easy-to-handle products that can reduce hazards and aid in personal stability while away from home. I would definitely buy this product again! Finally...something that actually holds my rugs in place! I've tried several other products & none worked. I always have always had a problem with my rugs buckeling up until I bought these corner carpet grips. Best buy ever. This is easy & held on floor. It holds so door opens. U shouldn't trip. I have a cat and dog who are always chasing each other around. The rugs on the entry floor and bathroom are always bunched up. Dangerous for me as well as a pain in the neck to fix all day long. These are doing the job. My husband placed two of these on the front corners of a throw rug we have in front of our kitchen sink. They work very well and I have not had the rug flip up on either corner when I'm using that part of the kitchen. We checked after several hours to make sure that there wasn't any sticky residue on our kitchen floor under the carpet grips and there wasn't. Make sure your rug and floor is clean of dirt. Put one on each corner. Put the clean side is against the rug. Looks like this will work. Have not used yet but looks like it should work. Waiting for husband to help me with rug. Ordered 2 sets. 1 set came without stick 'em on both sides and were useless. Thought it would do the trick! Does not work on "carpet to carpet" at all. Did not stick like advertised. then out. I hate it. I tried this on two different carpets, did not work on either one!! Very disappointed. they do not stick to anything, floor or carpet' they should not even be sold. I ordered 2 sets and they don't work. I ordered 2 sets of them I was so glad to get them I have tryed them on the Carpeting also in the bathroom floor with my.rugs they don't work. These were definitely worthless. They were on my rugs for only a matter of days. The rugs DID NOT stay in position immediately. I just threw away my money on these. They work their place right off any rug you place them on!They do not work! As I get older, I tend to have balance issues, so I thought this would be a great idea to keep the rugs from turning over my feet. My husband and I tried to get them under the rug, but they are not holding. I think I would like my money back. Didn't work on carpet or hardwood floors. Would have cost more to return them. Didn't work. Rolls right off the rug. Rug still moves. I give up!!! I was looking for a product that would keep my area rug in place on carpet. The product would not adhere to the rug even with the extra pad to be used in this event. Total waste of time and money. Think they may keep my recliner in place on my laminate floor. I need rub grips because I keep tripping on my rugs & these are a good deal ! Just hoping that they work for what I need. To keep my rugs flat and not a trip hazard. I have throw rugs and I want to avoid falling or have them slip around. Just I was looking for. I haave area rugs and need ti keep them from slipping. I hope these work! To try out and see if they work. Need. To stop my rugs from sliding hopefully ! I need to hold my area rugs in place. Other rug/floor grips have been unsatisfactory. This type seems worth trying. Hoping to keep my rugs from rolling up and tripping someone. To hold corner of rug down. I Chose these for safety in our home, preventing tripping on the rugs coming up on the corners or traveling around. We have a new 8x10 area rug that won't stay in place, so we need something to encourage it to. Need to secure rug from rippling. used them before, But I had to much cat hair. So I thought I'd try them again to keep rugs in place. For safety so that we don't keep tripping over the rug corners. do these attach permanently to the rug or can they be moved to a different rug? They could be moved to another rug, with some difficulty as the glue may not be as good, but quite frankly we have not found them very effective as we have a rug on a carpet. They have not lasted very long and the rug never stays in place. Perhaps they would work better with a rug on a wood floor. You probably can move them to a different rug. If you do you might lose some of the adhesion, and should probably clean them before trying to stick them to the second rug. Yes they can. If you have a lot of sand they may not. They work well for us even with water from the pool getting the rug wet. They do not attach to a rug and stay on. I used a couple of them and have not used any more as they do not hold down the rug. The can be removed. It will pull threads out of the rug from the back. Don' purchase. They can be removed and moved to another rug at least once. Sorry, never used them. They were a gift. Enter an answer to this question. Does this work on area rugs that are on top,of a carpeted floor? I ONLY USED THEM ON HARDWOOD FLOORS WHERE I HAD THROW RUGS. THEY STILL WORK FINE. I don't know. I only used them on a tiled floor....wasn't real impressed. That is exactly why I got these and they did not work well for me. No, not a good item to purchase. Don't work on either. not sure about carpet but works on the floors..
Only for a short time. I wouldn't buy them. No they do not work. 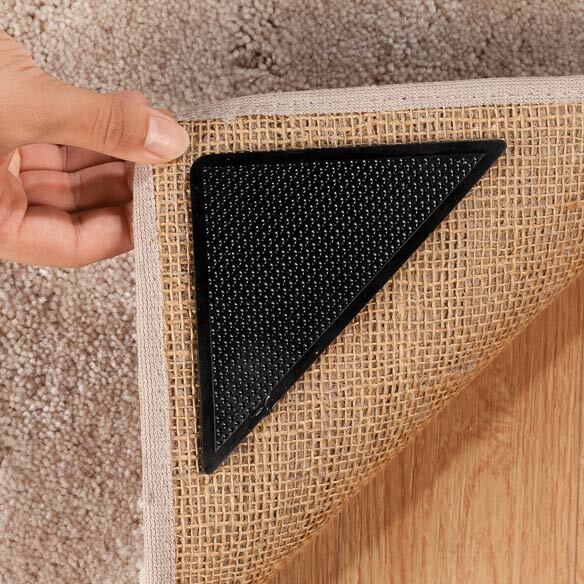 Do these corner rug grippers actually work when you are trying to attach carpet to carpet? I am not trying to attach carpet to hard floors. BEST ANSWER: No, once I figured out how to use them, they don't work at all. Will not buy again. Hardwood or Carpet. No. They will not attach carpet to carpet.